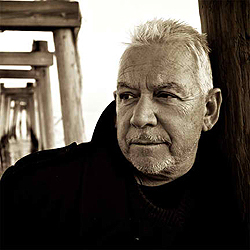 As you all should well know by now, Eric Burdon is an English singer-songwriter best known as a member and vocalist of rock band the Animals and the funk band War. As the lead singer of the Animals, Burdon was one of the British Invasion's most distinctive vocalists, with a searingly powerful blues-rock voice. 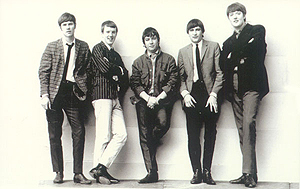 When the first lineup of the group fell apart in 1966, Burdon kept the Animals' name going with various players for a few years. 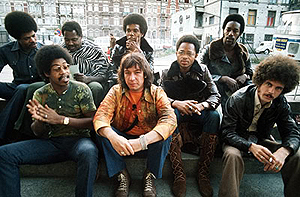 Usually billed as Eric Burdon & the Animals, the group was essentially Burdon's vehicle, which he used to purvey a far more psychedelic and less R&B-oriented vision. Burdon's real triumphs as a solo artist came at the beginning of the '70s, when he hooked up with a bunch of L.A. journeyman soul/funksters who became his backing band, War. Recording three albums' worth of material in the year or two that they were together, the Burdon/War records are still go-to albums for all true followers of his music. Especially their number three hit single "Spill the Wine." After both WAR and the second incarnation of The Animals had run their course, Burdon continued on this journeyman path until well into the new millennium. He recorded such solid albums as 2004's My Secret Life, 2006's Soul of a Man, and has now released Til' The River Runs Dry. Oh, and he was ranked 57th in Rolling Stone's list The 100 Greatest Singers of All Time. 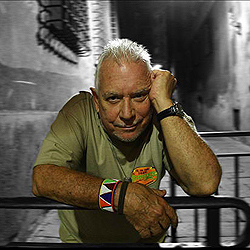 Chatting recently with the legendary singer himself Eric Burdon, I first wondered being that he had been hailed as "one of the 100 Greatest Singers of All Time" (Rolling Stone Magazine), as we sit here today how did such an accolade truly sit with him? "It's good to be recognized by one's peers. There are a lot of great singers on that list and I'm proud to be mentioned as one of them. However having grown up in a society where class is as evil as race, I decided years ago that competition has no place in the arts." Having been a part of the Animals, WAR and solo for so long also, which one true highlight of your musical life still today stands out as being a go-to memory? "Paris Olympia with WAR. I love this venue and I am looking forward to return to it this November." Another memory: I was in New Orleans one night when it was pouring rain. It was too dangerous to be on the streets as the rain was coming down heavily. I was stuck in a bar with no place to go. My audience, a policeman, an off-duty nurse, a driver from the public transportation and a competing blues guitar player. I grabbed the microphone and sang the blues all night long. Nobody moved. They couldn't anyways. A truly captive audience." You still tour across the world, playing many shows in many different countries, with no sign of stopping. What keeps you going these days? "The bills!! Someone has to pay them. I love what I'm doing but if I had the choice I wouldn't be traveling quite so much. I'd spend more time recording, enjoying my life with my fellow musicians in a studio." And what has changed the most about touring from back in the early '60s to today? "Airlines are more difficult to deal with but the accommodations are better. The sound technology has improved over the years but also depends on who is on the mixing board as well as the acoustics of the room. You have to take everything into consideration." Something I've always been curious about is shortly after you joined the Alan Price Combo they changed their name to the Animals. So, why the change, in general and where did the Animals originate anyway? "The band originated on the banks of the River Tyne in Newcastle England. But let’s get things straight." "I didn't join the Alan Price Combo. I asked Alan to join our band. When Alan Price was performing with his combo for white-collar dinner clubs, I was in Paris searching for Memphis Slim. The Animals name came from a friend of mine named Animal Hog, who was the most well-known character in a gang of homeless, ex Military guys called the Squatters, who lived out in the countryside." You were part of the infamous British Invasion back then along with the Stones, the Beatles, the Dave Clark Five, the Kinks, etc. So if you had to pull one incredible memory out from those USA touring days what would it be? "I was traveling with Chuck Berry to San Francisco to begin our tour with him in US. As I was sitting next to him I saw him writing on a napkin the words to “The Promised Land,” which he later recorded and became one of my favorite Chuck Berry songs." And what would be your own personal favorite Animals song to listen to today - and why? "'Don't Bring Me Down' is my favorite. It's just a great single. It has great atmosphere." Once Alan Price left the band and it was renamed Eric Burdon and The Animals (or in some circles EB and the New Animals) the music went more psychedelic. Changing with the times is understandable, but was it as successful for you as you had hoped? "It wasn't when Alan Price left the band. Promoters started advertising the shows as such, way before that, and I had nothing to do with it. This pissed the rest of the band off and most likely led to the break-up of the band. The psychedelic sound was very successful and it was a genuine need that I had to express my new experiences." ""Monterey," "San Franciscan Nights," "Sky Pilot," "A Girl Named Sandoz," "Yes, I'm Experienced," the albums, "Twain Shall Meet" and "Winds of Change... "Gratefully Dead," was written in homage to Pig Pen. All the stuff I did with Frank Zappa, "All Night Long." All that stuff was pretty psychedelic and I'm proud of it to this day and happy that I did it." And the original Animals reformed in 1975 and brought out Before We Were So Rudely Interrupted in 1977. Although carrying as brilliant an album title as there ever was, it sadly crash-landed right into the dawn of punk. In reflection were you as blindsided by Punk's awakening as it would seem? "No, I was happy that the late 70s and 80s had the punk sound. It was very close to what we had been doing all along. People like Patti Smith, Iggy Pop, Joan Jett came out of this. Punk was an expression of the pissed off younger generation. Just as I had to express my psychedelic experience, the kids had the same need to express their reality. I was very sympathetic with the politics of this movement but some of the music was second rate. As to why Before We Were So Rudely Interrupted didn’t make it is because The Animals wouldn’t tour to promote the album, as it should be, so nothing happen to it. It died on the vine." Your days with WAR seemed to provide incredible musical goodness, but was it like that from the inside also, perhaps? "It was great for what it was and for as long as it lasted. From the outset we were a band of brothers and It showed me that I had life beyond the Animals." Only having been part of WAR for a few years, to this day which of their songs is your favorite to listen to - and why? "I still do "Spill the Wine" live. I like the improvisational poetry aspect of it." You've released a lot of solo work and have had musical associations with en masse of other artists over the latter years, which have all led to your new album, 'Til Your River Runs Dry. But is it true that the first single, 'Water' was inspired by a chat you had with Former Soviet Premiere Mikhail Gorbachev though?! "Yes, it is true. I had the chance to meet with Mr. Gorbachev while doing a television show in Germany and I asked him what he felt was the world's most pressing issue. He turned to me and said, "Water"." 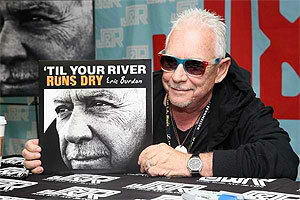 Everywhere, when associated with the release of this new album people are claiming "Eric Burdon is back, bigger and better than ever." In truth, did you actually go away, or was it just down time, per say? "Neither, I've never stopped recording, touring, performing and experimenting. I think the fact that I was rediscovered has a lot to do with Bruce Springsteen citing me as an influence in his SXSW keynote address and I thank him for that." Indeed, said new CD is indeed a stunning example of how an album should be constructed, but just how personal are the songs in relation to actual stories of your own life? "Very personal. Dig, I took the time to write the majority of the songs. It does reflect where I'm at. It has songs about my friends, my heroes, the love of my life and the state of the world today, political and environmental. Every song has a personal meaning for me." If this new album were a literal message to your fans what would it be? "Never give up. Never give up on love. Never give up the fight. Never give up your personal dignity. Give it all you've got as long as you can, until your river runs dry." What kind of a relationship did you have with Jim Morrison - did he steer you in any directions, give you good/bad advice along the way, perhaps? "He was a great Voice for sure. That’s all I can say about the man." You recently took the stage with Bruce Springsteen and The E Street Band at Cardiff's Millennium Stadium (07/13) to perform 'We Gotta Get Out Of This Place'! Wow, how did all that come together? "He was touring England at the same time as I was in Europe. I was in Finland, and on my way to Edinburgh, I had a day off. I was depressed by the weather and I heard that he was playing in Cardiff. I love his energy so I went to see him. He invited me on stage and that was that." Finally, and throwing you a journalistic curve ball, we here at Exclusive Magazine love Penguins - do you also have any love/fondness for them, perhaps? "I do. They are amazing creatures. They are the gentlemen’s club of the sea. I love every animal on this planet and I enjoyed "March of the Penguins" with Morgan Freeman's narration and highly recommend it."